Shortly after Hugo’s 14th birthday he reached a point where he was in almost constant pain. He was pacing, not wanting to lie down, and had a lot of trouble sleeping or even sitting. His daily walks, which he used to love, had been curtailed so much he was barely making it to the end of the driveway and back. He also had an almost constant cough. He had visited the conventional vet many times and was on heavy doses of multiple painkillers. Even so, he was still in great pain. It was obvious that conventional medicine was not working and I was beginning to despair. I started to research other means of controlling pain and many people talked to me about how acupuncture had helped them. 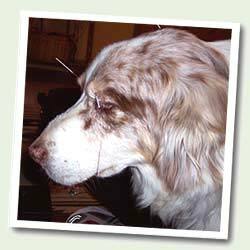 I knew that Dr. Childs used acupuncture so I decided to give her a call and try it. After the first visit I didn’t see much difference. But I had been cautioned that it usually took a few sessions for any effect to be seen. Well after the second session I was astounded. The transformation was amazing. Hugo, who had been unable to relax for months, fell asleep almost immediately after the treatment and slept peacefully for 3 full hours. Dr. Childs visits once a week and Hugo has shown steady improvement – almost back to his old self. He is once again able to enjoy his walks and his life. Dr. Childs also recommended a regimen of herbal supplements and Hugo’s cough is much less debilitating. 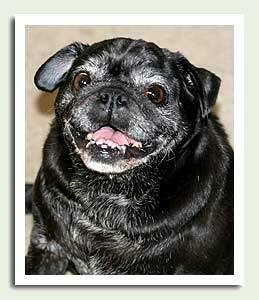 Hugo is an elderly pug and has his ups and downs, sometimes needing an extra treatment. But he is markedly improved and very happy. I would highly recommend Dr. Childs to anyone. We are so grateful to Dr. Childs for the excellent results we have seen with our Australian Shepherd, Marshall. Marshall has an auto-immune type disease that affects the skin on the end of his nose and the area around both eyelids. Before we met Dr. Childs, Marshall’s nose was constantly raw and bleeding. And with the conventional steroid therapy our regular vet tried, he could never form a healthy scab and begin to heal. The area around his eyes wasn’t much better, and they just oozed with blood and mucous. Then we were referred to Dr. Childs at Natural Health for Pets. After her recommended herbal and acupuncture treatments, Marshall is doing much better.The inflammation and raw sores have lessened greatly, and when he does get a spot, he actually forms scabs and heals. This has turned out to be an excellent way to manage a chronic condition while avoiding the life-long use of steroids, which are the only thing conventional medicine can offer for this condition. Now we don’t have to worry about the dangerous side effects associated with long term steroid therapy, and we have a much happier, healthier pet. Thank you so much, Dr. Childs, for your knowledge and expertise in caring for Marshall!